What about playing the lottery? Current statistics suggest that there are six million compulsive gamblers in the United States today, and more than one million of those are teenagers. It is estimated that 46% of Americans play the lottery. That is nearly half of the population of the United States spending money on lottery tickets. You are twelve times more likely to die in a car accident driving to the store to buy lottery tickets, than you are to win a gigantic jackpot. Lotteries are basically just a way of getting money from people who are desperate, greedy, lazy, ignorant, or any combination of these traits. That may sound a bit harsh, but it is pretty much the truth. People who are financially desperate don't know what else to do, so they play the lottery hoping to win the big jackpot and eliminate their current financial troubles. People who are greedy play the lottery because they want to get wealthy without having to work for it. They want to be rich, but are not willing to make any real effort to make it happen. Oftentimes, greedy people are also impatient and are not willing to build their wealth over time--they see the lottery as a way of getting it all right now. Lazy people are often motivated by the same things as the person who is greedy. Additionally, the lazy person refuses to read any self-help books, won't go out looking for a better job, won't put any money away in savings, won't increase their education or learn new job skills, and usually blames others for their problems instead of making the effort to fix them. Lazy people play the lottery hoping that the big jackpot will make up for all of the things they are too lazy to do for themselves. Ignorant people, which may also include many of the people just discussed, play the lottery because they just don't understand how the lottery actually works and they don't understand the math involved. Since ignorance represents the most common cause of people playing the lottery, let's talk about the math behind the lottery. When you play the average, big-jackpot, state lottery game, your odds of winning are often somewhere around 150 million to one. 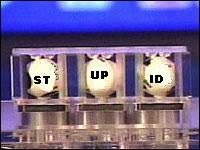 Although in some lotteries the odds may be a bit better than this, in many lotteries the odds are actually much worse. Mathematically, that means that the only way to make sure you win would be to buy 150 million tickets. That's 150,000,000 tickets! If you buy one ticket per week, you would mathematically have to play for 150 million weeks to be assured of winning. In other words, you would have to play every week for almost 3 million years. That's 3,000,000 years! "Not a problem," you might say, "I buy 20 tickets at a time." Good for you, now you only have to play for around 145,000 years. Yes, many times you hear about one or two people who win the big jackpot, but you have to think about how many people all over the state, or the Country, bought tickets. For those one or two winners, how many people actually lost? Do you have a chance of being one of those people who win the big jackpot? Of course, but mathematically you will not be able to pull it off within your lifetime. The lottery commissions know this. That's how they make money. Millions of people buy tickets and only a few ever win. After paying out the prize, the lottery commission gets to keep all of the extra money from the people who didn't win...week after week...month after month...year after year! And to make it even worse, the prize is often actually paid out from the interest earned on all the money the commission took in selling tickets, so they really don't have to pay out any of what they took in. It adds up fast--for them anyway. And as if all of this weren't enough, there can be some very dire consequences even if you do win a huge jackpot. For one thing, if someone is already bad with money, and bad enough that they're wasting it on lottery tickets, then they are very, very likely to mishandle the proceeds from a large lottery jackpot. More than half of the people who win a huge lottery jackpot are actually bankrupt within ten years! Think about this: if you suddenly came into that much money, how would you know who your friends really are? Do people like you, or do they just like you for your money? How many friends or family members would want to borrow money from you, or want a hand-out? How would that effect those relationships? And speaking of relationships, the divorce rate for people who win a large lottery jackpot is around 87%. Evelyn Marie Adams won the New Jersey lottery twice in the mid-1980s but still managed to lose the entire $5.4 million. West Virginia's Jack Whittaker, won $315 million on Christmas day, 2002, and five years later was blaming the money for causing his granddaughter's fatal drug overdose, his divorce, his inability to trust others, and the hundreds of lawsuits filed against him. "I don't have any friends," he told The Associated Press in 2007. "Every friend that I've had has wanted to borrow money or something and of course, once they borrow money from you, you can't be friends anymore." The lottery commissions also play on people's addictive behavior. After a short time of playing the lottery regularly, you begin to fear that if you quit playing, that will be the time that your numbers come up. Remember, your chances of winning a big jackpot in the first place are ridiculously slim, and even if your numbers do come up after you quit, you're probably better off without all of the problems that come with being a big lottery winner. All right, now that I'm done with all of the warnings, here's something a bit more positive that you need to know--you can be your own lottery and win every time. According to recent statistics, the average lottery player spends around $25 per week playing the lottery. Let's be our own lottery by keeping our lottery ticket money for ourselves and see what happens. See, being your own lottery by saving and investing the money you would have spent on lottery tickets is like winning a $20,000 jackpot every ten years! If you are young enough to have 35 years until retirement, you could have a total of $379,664 in your Growth Stock mutual fund at retirement! If you played the lottery for those 35 years, you would have spent $45,500 on lottery tickets and, according to the math, never have won any big jackpots. From age 20 until retirement at age 65, $25 per week grows to over 1 million dollars! Being your own lottery in the way just described, you win every single time instead of one in 150 million! If you are buying lottery tickets, don't ever say that you have no money to put into savings. You have it, but you are giving it to the lottery commission instead of saving it for yourself. The lesson here, now that you know the math and are no longer ignorant about how the lottery works, is to stop wasting money on a lottery jackpot that will most likely never happen (and likely ruin your life even if it does happen) and just put the money into savings and investments. In the end, you'll come out way ahead of all of those desperate, greedy, lazy or ignorant people playing the lottery. To learn a lot more about saving, investing, eliminating debt and becoming wealthy, please read the articles on the Financial Page. There, you will find a veritable treasure of what to do and how to do it...all for free! This article copyright © 2006 by Keith C. Rawlinson (Eclecticsite.com). All rights reserved.